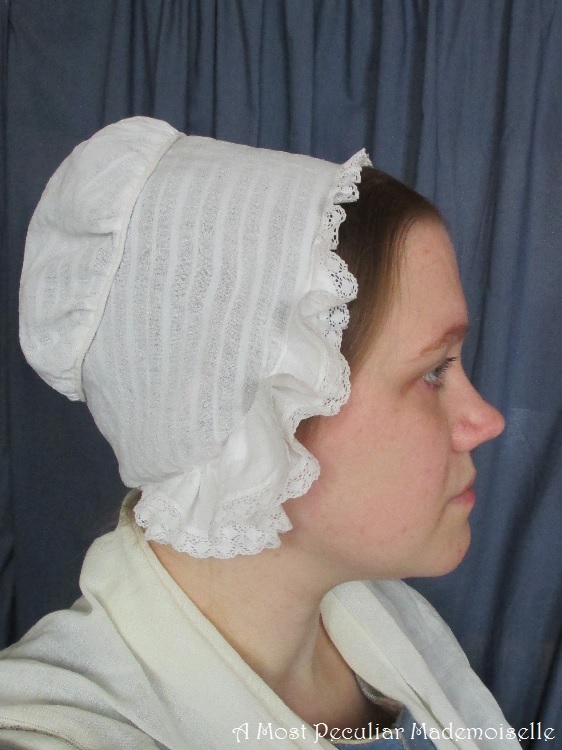 Almost six years ago I experimented with making an 1840s woman’s cap, and the result turned out quite well. I’ve since used the same pattern as a base for a more posh cap. This is a picture of when I’d first made it – look how young I was. 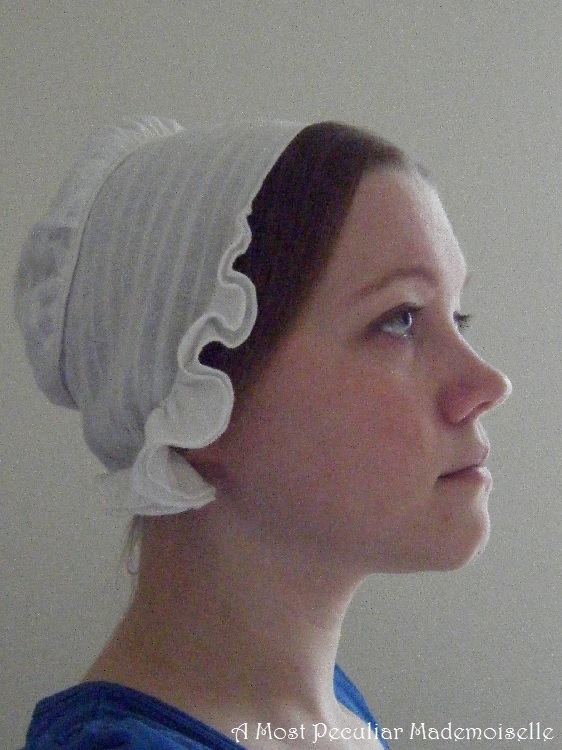 I then starched the cap. 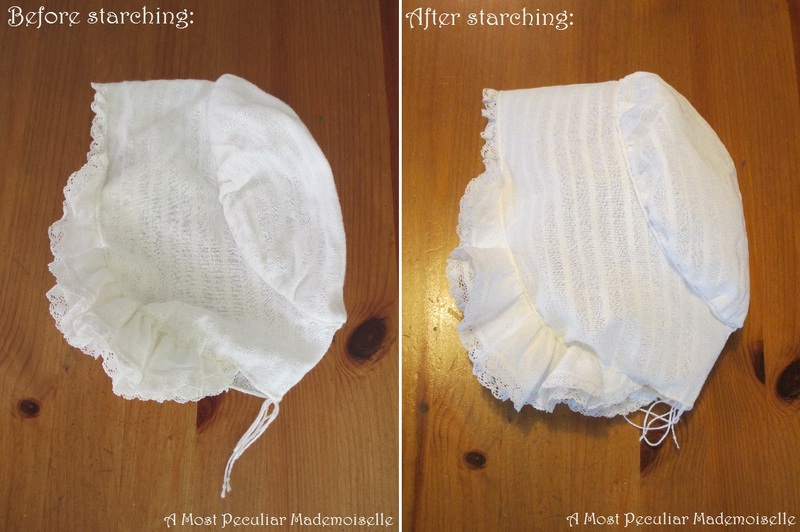 Starch does wonders to many historical items of clothing, making them look (and sound – starched petticoats rustle in a special way) much more like their very often starched original counterparts. It takes a bit of time and effort, but is worth it if you want to add that extra little something to your impression. Also, starched items get a protective surface that will make it more difficult for dirt and grime to get hold. Of course, if it’s too wet or humid when you venture outside, the starch will lose its oomph quickly. Here’s what my cap looked like before and after starching: all limp before, and holding up well after. I used 300 millilitres of water and 1 teaspoon of potato starch. This produce a light starch that I rather like. If you want a stronger starch, add more potato starch. I put a little bit of the water aside, and brought the rest to the boil in a pot. I then poured the potato starch mixed with the water I’d saved into it, mixing hard to avoid the forming of jelly lumps. I let is boil for a couple of minutes, stirring all the time, and then set it aside to cool. 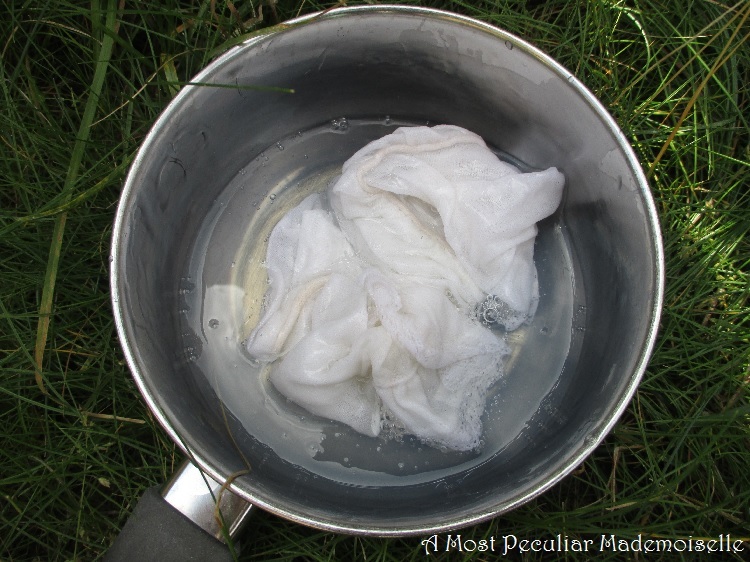 I took the cap and pot of starch out into the garden, and dunked the cap in the slippery goo until it was saturated. I wringed it carefully and then smoothed it out as well as I could. I hung it on a line to dry in the wind. When it began to dry it a slightly stiff, papery feel to it, holding up quite well on its own. After it had dried I ironed it, and it looked beautiful. I look a bit tired though, having pregnancy related iron deficiency. 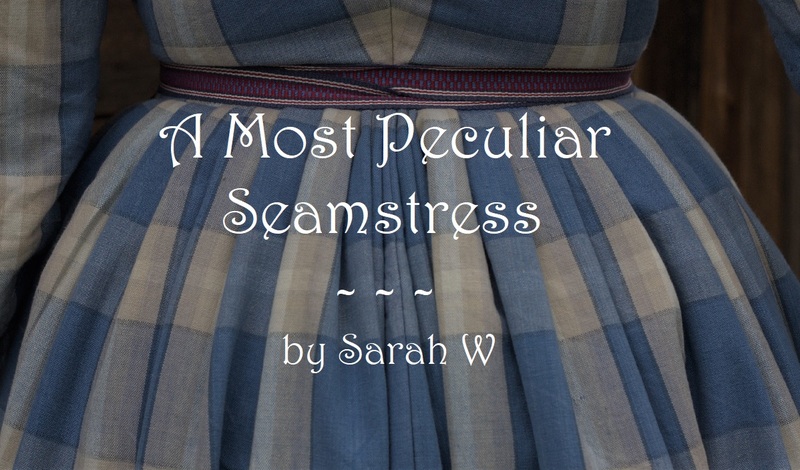 While this is a totally lame entry, I treat it as a UFO and submit it just the same, as it will make me feel better – I’ve just managed one other challenge this year. 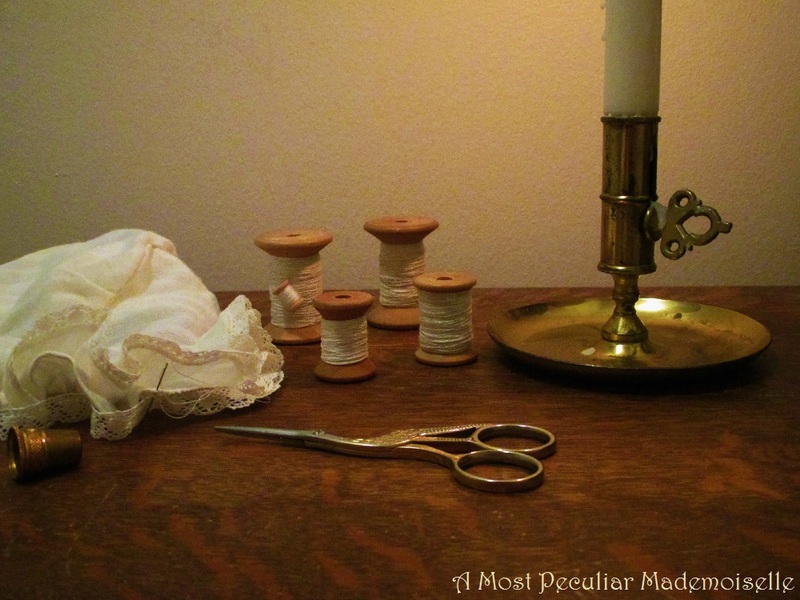 Fabric/Materials: Striped cotton (recycled from a worn out blouse) and cotton lace from an old set of baby sheets. How historically accurate is it? It looks all right, and the techniques I’ve used are documented, but I’ve never had the opportunity to look closer at an original, so… who knows? Hours to complete: Originally – no idea. Trimming it – an hour or two. First worn: For the pictures – I need a dress to go with it. Total cost: The blouse the fabric came from was an old one of mine that wasn’t fit to use any more, so I’ll count that as free. 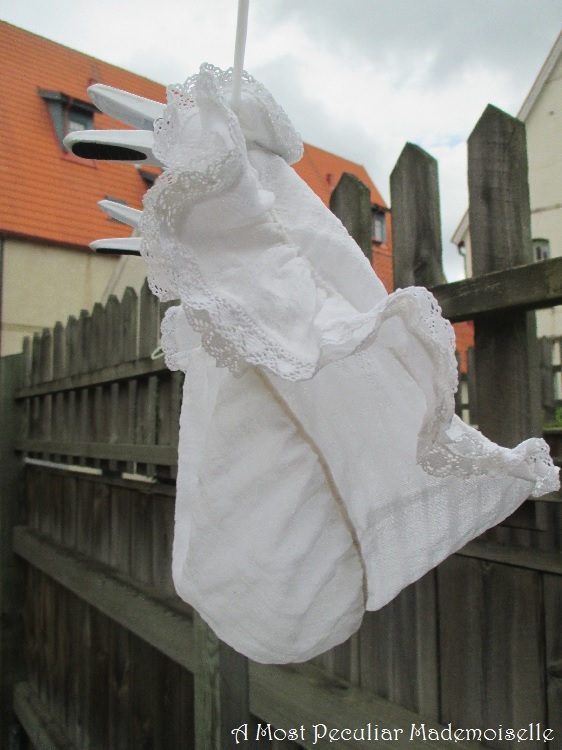 The baby sheet and pillowcase where the lace came from was picked up in a charity shop, so not much. 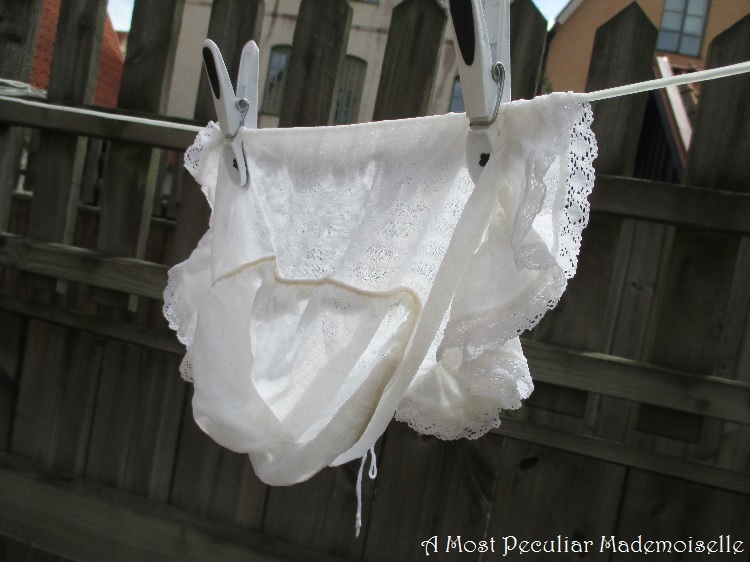 They will likely be used for a 19thcentury infant’s dress eventually. Congratulations!! It's such a joy to see your family grow. I can't wait to see the things you create for your new little one.